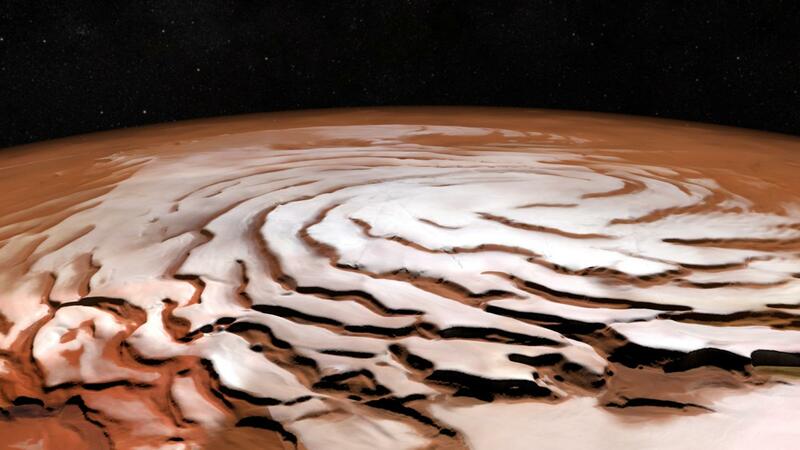 A new mosaic from ESA's Mars Express shows off the Red Planet's north polar ice cap and its distinctive dark spiralling troughs. The mosaic was generated from 32 individual orbit 'strips' captured between 2004 and 2010, and covers an area of around a million square kilometres. The ice cap is a permanent fixture, but in the winter season – as it is now in early 2017 – temperatures are cold enough for around 30 percent of the carbon dioxide in the planet's atmosphere to precipitate onto the cap, adding a seasonal layer up to a metre thick.